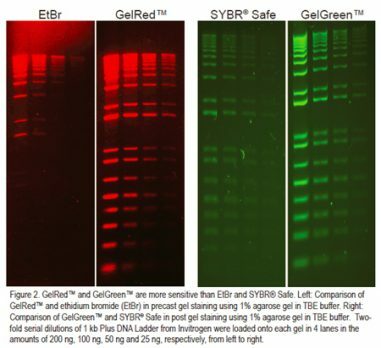 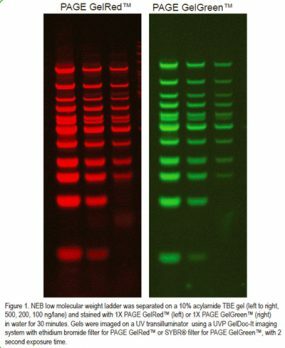 GelRed™ and GelGreen™ are the only gel stains specifically designed to avoid interacting with genomic DNA by being cell membrane impermeable. They are highly sensitive either as precast gel stains or post gel stains. Designed for use with a 312/302 nm UV transilluminator, GelRed is much more sensitive than EtBr, and at least as sensitive as or brighter than SYBR Gold in post gel staining. 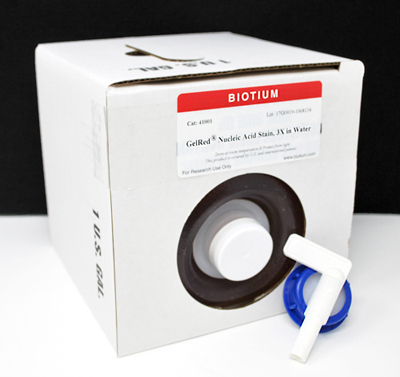 Extensive tests, including those by third party labs, demonstrate that GelRed and GelGreen dyes are non-toxic, non-mutagenic, and non-hazardous for disposal. 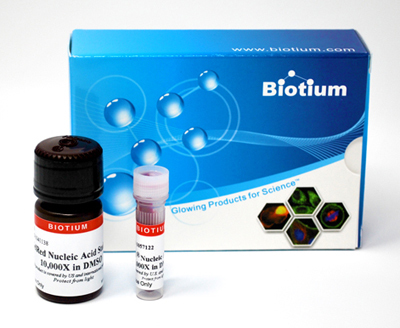 Perfect compatibility with a Standard UV Transilluminator or a Gel Reader.